I love snowflakes despite having spent most of my life living in a non snowing city! As strange as it may be but there is something about watching snowflakes fall that makes me happy. Recently, I came across Steve Maraboli’s quote comparing people to snowflakes. 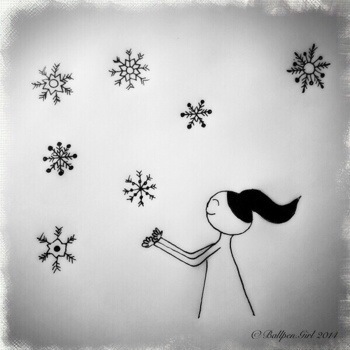 Maraboli talks about how no two snowflakes are alike but each snowflake takes the perfect form for its journey. The path of each snowflake is different, some collide and damage each other, some collide and join together, some influenced by the wind. Basically, there are many transitions and changes it goes through, but no matter what the transition, it finds itself perfectly shaped for its journey. We too are the same. Each person is taking different journeys, different routes but we are heading to the same place and along the way, we sometimes bump into each other, we cross paths, we become altered, we take different forms. We too are 100% perfectly imperfect and we are all 100% perfectly imperfect for our journey. This entry was posted in Life, Quotes and tagged life, perfectly imperfect, snowflakes, Steve Maraboli. Bookmark the permalink.